Today I was back in Boston. This time for the improv event organization Boston Society of Spontaneity (http://www.bostonsos.org/). Instead of finding out a month beforehand what an event will be, we are just told that there will be an event, and given the time. The "what" of the event is usually emailed to the RSVPed participants the night before, but this time we didn't even get that luxury. A few more than 40 unknowing people showed up at 2:00 sharp this afternoon at Government Center. I was appointed cameraman, and took a high-def video camera into my possession. Right before we left our meeting location, we were instructed that at 2:15 we were going into slow motion behind Quincy Market. It was a time crunch and we showed up just as our cell phone alarms went off. A few people shopped, and I walked around the back to get some video. I put the camera sticking out of my pocket and walked in slow motion towards the center of our group to get some good footage of a slow-motion fight. I turned to my left and saw someone taking their time lighting a cigarette, so I faced his direction to get a good angle and slowly put on my sunglasses. After our 5 minutes was up, we returned to our meeting location. 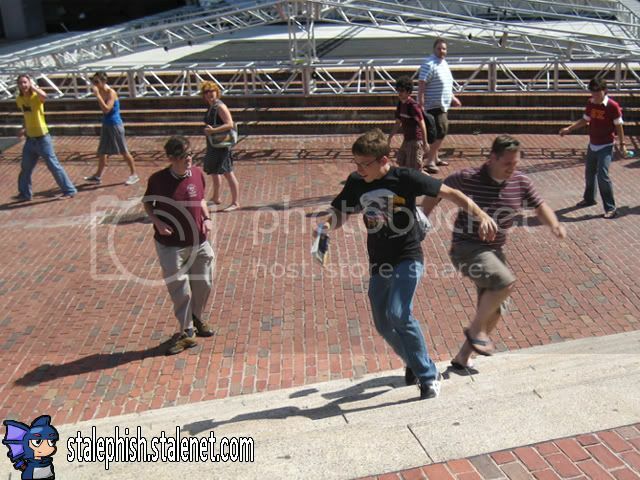 Our next stunt was to play tag with random strangers. We tried to sit around and not look suspicious (but really, 50 people standing around a normally non-populated area is a difficult task). The non-involved people were pinched through a narrow area, where one of our participants would tag them, and then the lot of us would run and hide. Most of the strangers just kept walking, but some joined in after some hesitation. Once we were exhausted, we decided as a group to go to Wendy's for lunch. Most of the group dispersed, but about 20 of us headed out. Our director, James Cobalt, got to the front of the line and bought 13 Frostys. It was very funny to watch the expressions of the workers when they heard that thirteen were ordered all at once. After we finished, seven of us stayed much longer and had very random discussions about future events, possibly involving cows. We'll see if that makes the cut, but I'm sure hoping it does. The next Boston SOS event is scheduled for September 13th, 2008, and will be a global event, and not just in Boston. To find out more, go to http://www.mp3event.com/!